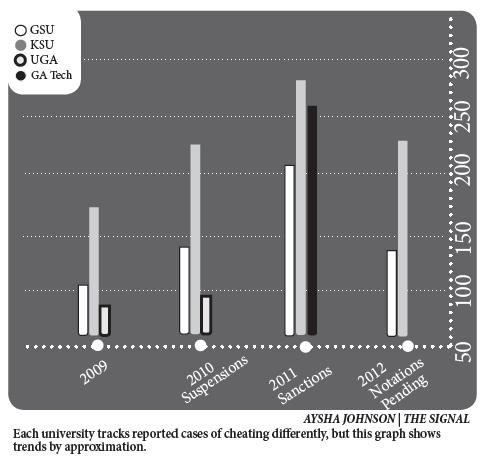 A look at Georgia State’s trend data of cheating for the fiscal year showed a decrease in reported cases. Contrary to September’s report by The Signal, the complete fiscal year data shows a decrease by 67 reported cases. According to the Dean of Students, Georgia State compiles academic dishonesty data by fiscal year because paperwork and an appeal process make it difficult to track reports by academic or calendar year. Professors are also not required to report a student cheating to the university. Teachers have the option to discipline a student within the classroom either by failing them or making them re-do the assignment. Another challenge with tracking data is because the college that the course a student is caught cheating in is responsible for the report, not the college the student is in for their major. Other state universities track academic dishonesty differently. The University of Georgia and Georgia Tech have their reports available by semester, while Kennesaw State’s records are by school year.